First quarter earnings season kicks off this week and the bar seems low. Consensus estimates for first quarter earnings season are calling for a slight year-over-year decline in S&P 500 Index earnings amid the economic soft patch at the start of the year. The one-year anniversary of the tax reform earnings boost in the first quarter of 2018 has made the annual comparison more difficult. We expect roughly flat earnings for the quarter, but the streak of seven straight quarters of earnings growth could come to an end. In today’s Weekly Market Commentary, we preview the upcoming earnings, highlight some key themes, and share some thoughts on the outlook for corporate profits in 2019. Signs of spring. A chilly winter is finally behind us, and flowers are starting to bloom. The U.S. economy kicked off the year with a disappointing first quarter as consumers and businesses weathered symptoms of a global slowdown. Thankfully, seasons change, and in this week’s Weekly Economic Commentary, we’re highlighting signs of a thawing in economic data. Lucky 7. Seven has been a lucky number for U.S. stocks. The S&P 500 just notched its first seven-day winning streak since October 2017, a feat that has occurred just seven other times in the current bull market. On the LPL Research blog later today, we’ll explain the S&P 500’s bullish tendencies after long winning streaks, and if we think equities could follow the same path. Week ahead. This week marks the unofficial start of earnings season, with several major banks set to report on Friday. The economic docket will bring U.S. consumer and producer prices, along with the minutes from the most recent Federal Reserve meeting. Abroad, trade figures out of China and Germany, which has seen a recent slump in exports, are among the data to monitor. Also, the European Central bank meets, and the U.K.’s Brexit deadline looms but an extension is likely. Track these and other important events on our Weekly Global Economic & Policy Calendar. 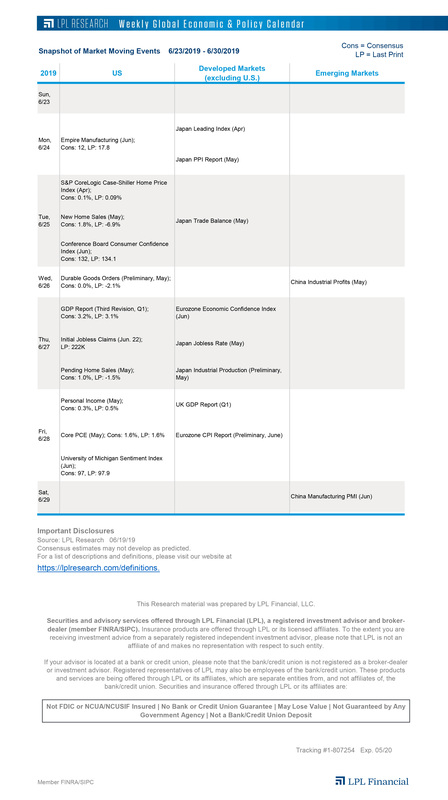 Weekly Market Drivers: For a quick recap of last week’s market drivers, which included: U.S.-China trade progress, (relatively) upbeat economic data, and some easing of the yield curve inversion, check out Friday’s Weekly Market Drivers post on the LPL Research blog.